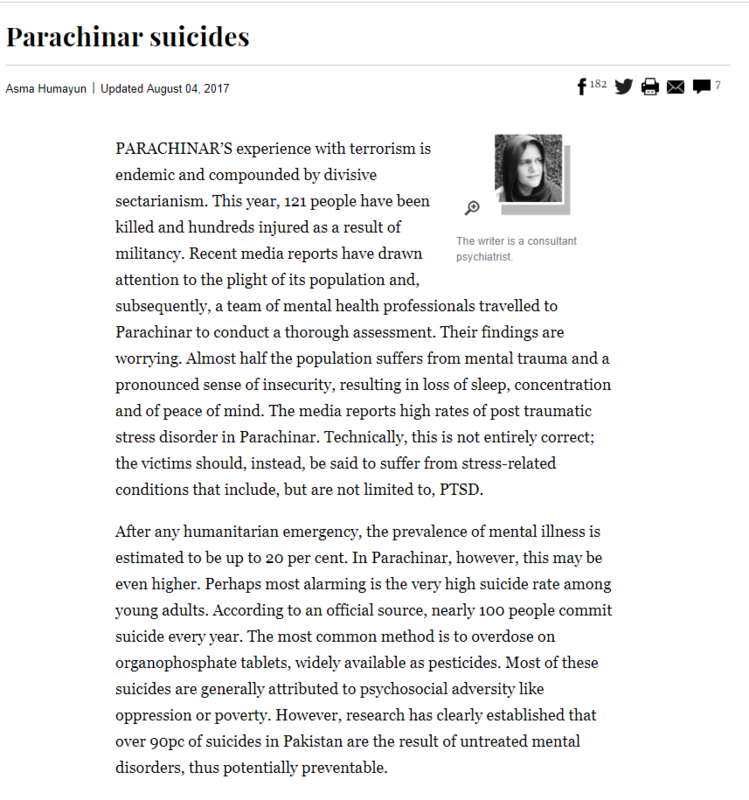 The aim of this initiative was to provide psychosocial support to traumatized families & building capacity for mental health care in Parachinar. 1. Conduct needs assessment to outline strategies for strengthening mental health services. 2. Provide psychosocial support and mental health care to the affected families. 4. Train teachers/community workers to provide ‘Psychological First Aid’. A mental health camp was held at the Agency Headquarter Hospital on Saturday, 29th July 2017. Four specialist clinics were set up where nearly 100 patients were jointly assessed with local doctors and treated for major mental disorders. A psychology clinic was also held for treating children with mental health problems/disabilities where 29 families were counselled. Essential psychiatric drugs were also provided at the camp. Training workshops were held for teachers/community workers were at the Zanana Hospital on 27th-28th July 2017. These workshops were based on the training guidelines on “Psychological First Aid” (WHO). These workshops were attended by ~25 teachers. The training also included guidelines for teachers to help children and their parents deal with traumatic experiences. 1500 brochures were distributed to schools to help traumatized children. The main training event was a workshop based on mhGAP guidelines by the World Health Organization. In addition, meetings were held with other stake-holders including health administrators, community leaders, journalists, politicians and the military leadership for raising awareness and future collaboration.